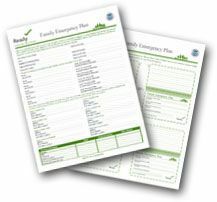 Preparing for an emergency is an essential step in keeping you and your family members’ safe when disaster strikes. As individuals and families, we spend thousands of dollars each year on health insurance to make sure that when we get ill or injured, we have the means to get the proper treatment. It’s just as important, and far less expensive, to prepare for a disaster, yet millions of families fail to do so. Taking a few simple steps now will dramatically decrease you chances of being injured, and at the same time, provide you with piece-of-mind. It may even save your life or the life of a loved one. FEMA and the Department of Homeland Security developed guidelines that are the basis of this Three Step Emergency Preparedness Planning Guide. Simply read through the following pages and follow the recommendations along the way. Complete each step, one at a time. When you’re done, you’ll sleep easier knowing that your family is properly prepared for a disaster. 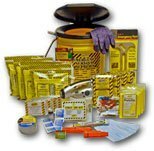 The first step, Get A Kit, helps you choose and purchase the proper emergency preparedness kit that you and your family will need to get through the first 72 hours (3 days) of a disaster. FEMA suggests that it could take 72 hours for an Emergency Response Team to reach your neighborhood in the event of a disaster, which is why you need to be prepared to take care of yourself during this critical time. The second step, Make A Plan, assists you in developing a plan that you and your family members will follow in the event of a disaster (How to contact each other, where to meet, etc.). A free planning document (PDF) is provided to you which you can open up and just fill-in the blanks. Once completed you simply print it out and store a copy with your Emergency Preparedness Kit. In addition, you can print out the credit card sized information sheet for each family member to keep in their wallet or purse. The final Step, Be Informed, provides you with comprehensive information that you and your family members should become familiar with. It contains information about all types of different disasters including: earthquakes, floods, tornadoes, hurricanes, thunderstorms, tsunamis, winter storms, wildfires, landslides, extreme heat cold, volcanic eruptions, and even information about terrorist attacks. Again, all of this is free, so don’t hesitate to take advantage of it.